Strickland was mostly a utility infielder who backed up Bobby Avila, Al Rosen, and Chris Carrasquel for the Cleveland Indians. 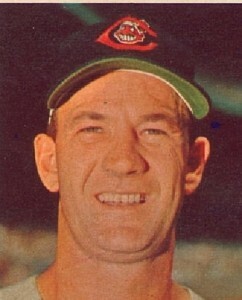 After his playing days were over he was a coach for Cleveland who had brief stints as the team’s manager in 1964 and 66. Before his career in Cleveland, he played for the Pittsburgh Pirates. He also coached in the major leagues for the Minnesota Twins and Kansas City Royals. RIP. George Strickland, the slick-fielding shortstop for the Indians in their historic 1954 season and a two-time interim manager for the team, died on Sunday at 84. The Indians acquired Strickland in a trade with the Pittsburgh Pirates on Aug. 18, 1952. Playing in an era when the value of middle infielders was determined by their fielding and not their hitting, Strickland batted .233 with 22 home runs and 213 runs batted in for the Indians before he was released on Aug. 3, 1960. For much of his time with the Indians, Strickland’s glove ably backed the Indians’ famed “Big Four” starting pitchers: Hall of Famers Bob Feller, Bob Lemon and Early Wynn, and all-star Mike Garcia. Strickland played 112 games, batting .213 with six homers and 37 RBI, in 1954, when Cleveland set what was then an American League record for wins, finishing 111-43 before being swept in the World Series by the New York Giants. Strickland was an Indians coach from 1963-69, usually stationed at third base. His first stint as Cleveland’s interim manager began on April 2, 1964, one day after manager Birdie Tebbetts suffered a heart attack, and days before the start of the season. The Indians went 33-39 with Strickland at the helm, before Tebbetts returned on July 5. Cleveland began the 1966 season 27-10, but had slumped to a 66-57 record when Tebbetts was dismissed as the manager on Aug. 19. Strickland took over, and Cleveland went 15-24 the rest of the way to finish 81-81. Strickland went back to his duties as the third base coach when Joe Adcock was hired as the manager. J.J. Hardy has been traded from the Milwaukee Brewers to the Minnesota Twins in exchange for Carlos Gomez. The teams announced the deal on Friday. Hardy, a shortstop, hit .229 last season with 11 home runs and 47 RBIs. He had a combined 50 home runs in 2007 and 2008. He has a career batting average of .262 with 75 home runs and 265 RBIs in 571 games. Highly regarded prospect Alcides Escobar is expected to be the Brewers’ starting shortstop next season. Gomez hit .229 with three home runs and 28 RBIs in 2009. He played in 137 games, often as a defensive replacement. Hardy will is likely to replace Orlando Cabrera who is at present unsigned. If Cabrera remains a Twin, Hardy is likely to be moved to 3rd base. I think the Twins came out ahead on this trade. Gomez is a run of the mill 4th or 5th outfielder. Cuddyer hit a solo home run in the eighth inning, lifting the Twins to a thrilling 5-4 victory over the Kansas City Royals on Saturday that moved them into a tie with first-place Detroit. The Tigers lost 5-1 to the Chicago White Sox. Sunday is the final day of the regular season. Joe Mauer delivered his biggest hit in an MVP-caliber season, a two-out single off Cy Young candidate Zack Greinke that broke a scoreless tie in the sixth. Delmon Young added a three-run double later in the inning for a 4-0 lead. After the Twins bullpen let the Royals tie it, Cuddyer hit his 31st homer of the season off Dusty Hughes (0-2). The Tigers have let a seven game lead with 4 weeks to go in the season, evaporate. This late season collapse might be the mirror image of what happened in 1987 when the Toronto Blue Jays blew a big lead late in the season and Detroit ended up as the AL East winners. Jason Verlander will go to the mound for the Tigers today, while Carl Pavano gets the call for Minnesota. I predict both teams win today, then Detroit will win the one game playoff.